District of Columbia maps from Omnimap, the world's leading map store with 275,000 map titles. Washington D.C., Maryland and Delaware Atlas & Gazetteer. 1:100,000. DeLorme. An excellent road and hiking atlas for the area. This is not a street atlas and thus is much more appropriate for the backroads of Maryland and Delaware than for use in Washington D.C.
Click here for detailed street atlases of Washington D.C.
Washington D.C. Travel and City Maps - Paper. The maps below are are larger than shirt-pocket sized but do fit in hip pockets and purses. Washington D.C. Street Map. 1:42,000. Rand McNally. This map covers a larger area than any of the other folded maps listed below - in exchange it shows less tourist sites and services. The map is the best for getting from The Mall out to the airports or to Alexandria, but the other maps below are better for tourists walking around the Mall, etc. The map covers Washington D.C. and the surrounding areas such as Alexandria, VA; Bladensburg, MD; Cheverly, MD; Chevy Chase, MD; College Park, MD; Falls Church, MD; Glenarden, MD; Hyattsville, MD; New Carrollton, MD; Takoma Park, MD. Folded paper map, size is 40 x 28 inches unfolded. Washington D.C. Street Map. Michelin. A detailed street map containing an extensive street index. Washington D.C. Street Map. ADC. 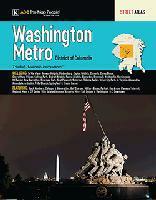 The Washington, DC City Map provides a Metro Washington & Vicinity highways & connecting roads map, featuring: Colleges & Universities, Metro Rail System, Parks & Rec Areas, Special Points of Interest Information & Washington, DC Area Map. Washington D.C. & Eastern Corridor Travel Map. 1:12,500 & 1:1,000,000. ITMB. This edition of the Washington D.C. map adds the new Eastern Corridor road map on the reverse. Washington D.C. is, of course, a hub for Americans, almost a secular pilgrimage site, but is also a fabulous treasure trove for international visitors as well, with museums and monuments depicting the growth of a great nation. Recently the Martin Luther King Memorial has been completed and added to the map and the Jefferson Monument has completed a refurbishment. This map uncovers all the statues, memorials, and buildings of interest. Of course, hotels, shopping areas, transportation hubs, parks, etc are also included. The reverse has a full-sheet map of the Eastern Corridor of the USA. Starting with Boston in the north, through NYC and Philadelphia to Baltimore and on past DC to Richmond and Raleigh, the Eastern Corridor encompasses one-third of the population of the United States and a dozen States. The map shows road and rail connections, with motorways noted in blue and toll roads in green, and includes major historic and touristic sites within the area of coverage. Sample detail of the Washington D.C. street map. Sample detail of the Eastern Corridor road map. $7.95 62-6092WI 1 sheet, folded. Washington D.C. Pop-Up Map. VanDam. Published by the award-winning graphic artist and cartographer Stephen Van Dam, these laminated pocket maps offer superb detail in a handy pocket-sized format. The maps include shopping information, subway system information, images of major landmark buildings to help you orient yourself in the city, a street index, blow-ups of the main city-center tourist area, and much more. Popups are their small, shirt-pocket-sized maps with the blooming-flower-style fold pattern. Size is 8½ x 11 inches open, 3¾ x 6 inches closed. Pop-Up map showing one side fully opened. Shows the origami-style folding of the map. Washington D.C. Travel and City Maps - Laminated or Waterproof. The following street maps are all pocket-sized, ranging from not much bigger than a credit card when folded, to 8" x 4" when folded. Sample detail of the Borch Washington DC map. Front of the Borch Washington DC map. REverse of the Borch Washington DC map. Washington D.C. Destination Street Map. 1:11,300. National Geographic Maps. Sample detail of the NGS map. Washington D.C. Red Map. Red Map. This unique map highlights the historical landmarks of the Capital. It includes the cultural center of the city, The Mall - home to the Smithsonian museums and the iconic monuments to Lincoln, Washington, and Jefferson. Also covered are historic Georgetown, trendy DuPont Circle, and politically driven Capital Hill. The map shows the best shopping, restaurants, and hotels as well as government offices and cultural institutions. Size when folded is 4 x 9 inches; 9 x 24 inches when unfolded. Sample detail of the Red Map map. Washington D.C. Artwise® Map. 1:24,000. Streetwise. About the only thing you can have people agree on concerning Washington DC is that museums are plentiful and admission is free. Washington DC is the museum showplace of America offering a diverse range of art collections to satisfy the interests of all types of visitors. The Smithsonian, affectionately referred to as America's Attic, alone has 16 museums. The ARTWISE® Washington DC Museum Map helps to clarify and organize your efforts to visit and absorb as much art and culture as your time allows. Size is 8½ x 4 inches folded and 8½ x 19¼ inches unfolded. Front of the Artwise map. Sample detail of the Artwise map. Washington D.C. MapEasy® Map. MapEasy. MapEasy's maps are artist's renditions of the city streets. Washington, DC is the most monumental and majestic city in the US. Designed on the scale and layout of European cities, Washington offers something for everyone. Let MapEasy help you tour this stunning city. With us, you will find that particular museum in the Smithsonian complex along the Mall. Looking to climb to the top of the Capital? We will show you how to get there. Stroll along the brick streets of Georgetown and stop in an outdoor cafe. We will direct you to the best ones! And when choosing your hotel, MapEasy will assist you by providing information and locations for all of them in the city! Why not take the Metro out to Old Town Alexandria? With MapEasy, you will not only know where to go but what to look for while you are there. The Washington, DC Guidemap includes detailed sections for Georgetown/Dupont Circle, Old Town Alexandria, and the METRO. Size is 18 x 27 inches unfolded. Sample detail of the MapEasy map. Washington D.C. Streetsmart™ Map. VanDam. Published by the award-winning graphic artist and cartographer Stephen Van Dam, these laminated pocket maps offer superb detail in a handy pocket-sized format. The maps include shopping information, subway system information, images of major landmark buildings to help you orient yourself in the city, a street index, blow-ups of the main city-center tourist area, and much more. VanDam offers three different formats. Streetsmart is their main line of laminated detailed acordian-folded city maps. Size is 9 x 24 inches unfolded. Front of the Streetsmart map. Reverse side of the Streetsmart map. Sample detail of the enlargement of The Mall portion of the map. Sample detail of the Washington DC Metro atlas. We stock all USGS topographic maps of Washington D.C. at all available scales. Delmarva Peninsula Map (Delware-Maryland-Virginia). 1:250,000. National Geographic Maps/Trails Illustrated #772. The new Delmarva Trails Illustrated regional topographic recreation map covers all major recreation areas for the Peninsula and Chesapeake Bay region. This beautifully designed map includes all state parks, state wildlife areas, national wildlife areas and key recreation access points. 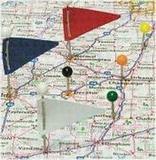 Locations for camping, boating, canoeing/kayaking, hunting, biking/greenways, and fishing are displayed. Highlights include Blackwater and Chincoteague National Wildlife Refuges, Assateague Island National Seashore, Cape Henlopen State Park, and Maryland's Eastern Shore. This map will be an essential trip planning tool, road map, and on-the-ground guide for accessing Delmarva Peninsula's public lands. Map size is 25-1/2 x 37-3/4". Virginia/Delaware/Maryland/Washington D.C. Raven State Wall Map. 1:500,000. This regional map is centered on the Chesapeake Bay area. Elevations are represented by color, and this, in combination with our relief shading technique, gives the map a 3-dimensional look. 34 x 65". $3.95 62-1000DC Washington D.C. flag, small. Size 4 x 6 in. $9.95 62-1001DC Washington D.C. flag, medium. Size 8 x 12 in. $39.95 62-1003DC Washington D.C. flag, large. Size 2 x 3 ft.